Apryl Rhinehart is a program associate who supports both the Market Analysis and Insight team, which promotes greater transparency and accountability in California’s health care system, as well as the Innovation Fund team, which invests in technology and service companies with the potential to significantly lower the cost of care or improve access for low-income Californians. 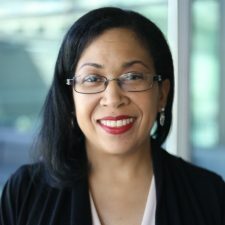 Prior to joining CHCF, Apryl served as the grants manager at the Kenneth Rainin Foundation, where she worked across program and accounting departments to establish efficient and compliant grants processes. She also led the grants management department in implementing a new online grants system. Before that, she worked as a program associate for the Marin Community Foundation, and held temporary positions as a program assistant at The San Francisco Foundation. Additionally, she serves on the advisory committee for the Sankofa Program at Merritt College, which addresses food insecurity within the student body, and on the development committee for MISSSEY (Motivating, Inspiring, Supporting and Serving Sexually Exploited Youth) in Oakland.